The cookies came out great! They tasted almost exactly the same as the grocery stores, except mines were much softer due to being freshly baked. They were delicious! Cream together butter, 1 1/2 cups sugar, the eggs and the vanilla. Blend in the flour, cream of tartar, soda and salt. Shape dough by rounded spoonfuls into balls. Mix the 3 tablespoons sugar and the cinnamon. Roll balls of dough in mixture. Place 2 inches apart on ungreased baking sheets. lol! gotta love the boyfriends... i took mine to a tea shop this weekend because they have an excellent blueberry tea cake... immediately afterwards, he said, "ok, learn how to make this." Hi blueskiez, I know exactly how you feel. =] Lovely boyfriends! I LOVE snickerdoodles! 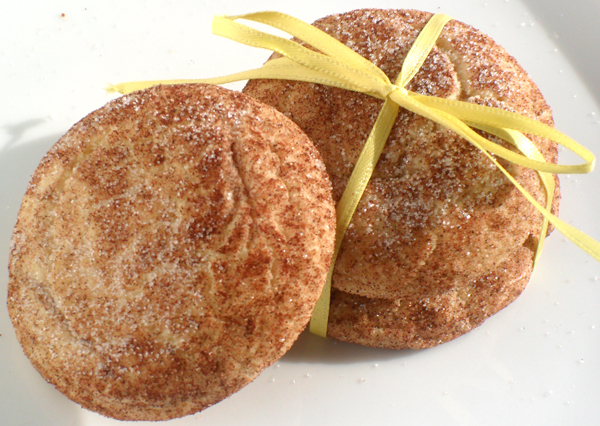 Yours looks so thick and soft, just the way a snickerdoodle should!